Guided by unexpected flashes of inspiration, Chitra Ramanathan’s powerful unique abstract paintings express her ongoing creative journey through a unique body of work which has produced delight, inspiration and peace to lovers of her artwork, Chitra Ramanathan’s acrylic and mixed-media paintings are characterized by intense colors and multiple layers of textures that interact with light to “challenge the boundaries of their two-dimensional surfaces” as expressed by an art critic, and are inspired by short-lived garden blooms and cyclical seasons both of which the artist compares with the continually evolving, ephemeral, fleeting happiness’ “formless form”, a phrase she has coined to describe her concept. Hints of circles signify the human life-cycle, trying times followed by happy phases and of life and rebirth influenced by her roots from India. Varieties textural materials layered on diverse surfaces such as canvas, plexiglas, linen, paper or anodized aluminum, create the illusion of extending the images beyond the confines of their otherwise two-dimensional surfaces under any light situation. Chitra Ramanathan’s work explores color, line that emerge as “formless forms” as she calls her abstracted images that mysteriously peek out of colorful details, while hints at circles that are also an integral part of her work signify the human life cycle. As a whole, her compositions and assemblages project an ongoing dialogue that offers endless possibilities to the viewer imagination. Chitra Ramanathan’s paintings arrived on the art scene in 1995 when various art galleries on Broadway, New York City invited the artist to exhibit in solo and group exhibitions. Her work was immediately noticed by art critics including Manhattan Arts magazine that praised the works’ unique style and rendering of colors true to Chitra Ramanathan’s roots as a child artist growing up in India. The exhibits transformed into opportunities as her paintings began featuring on the internet, with numerous originals being acquired by individual and businesses the following years. Since then, there has been no looking back. Chitra Ramanathan received her Bachelors of FineArts degree, majoring in Painting with honors in 1993 and her M.B.A degree with concentrations in Art Museum Administration and Human Resources in 1997 from the University of Illinois at Urbana-Champaign, USA. During her student years, the artist spent an extensive period of time studying art in Paris, France. The experience paved the way for her future abstract paintings that compare the emotion of happiness as cyclical and fleeting to ephemeral garden blooms, a concept influenced by the Impressionist Movement particularly Claude Monet’s paintings. Chitra’s ongoing goal and dialogue with her audiences is achieved through treating her canvases to fresh bright colors and intricately interwoven textural materials which are executed intuitively with rapid brush strokes. The results exude freshness, and transmit joy for viewers and owners of her paintings who have deemed them suitable for all venues. 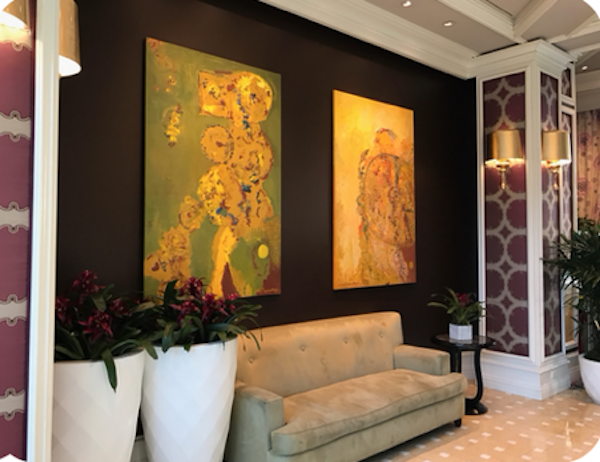 Many of her individual paintings are created in expansive scale or as multi-paneled works which makes them attractive for displays even in large venues such as lobby areas of public spaces. The artist’s working process evolves continually, with each developing piece being infused with new art materials, and cutting-edge techniques learned through educational avenues such as art conferences and professional artist residencies at organizations in France and Italy in recent years. A distinct feature in most of her works is that the pictorial space appears cropped as the imagery appears to stretch beyond the confines of the substrate, creating the illusion that the painting continues infinitely. An art educator as well, Chitra is an active member of Americans for the Arts. In 2005, the head of the Royal Academy of Arts. In 2005 she was invited to the Royal Academy of Arts, London, U.K as Visitor Artist for a visual and academic presentation of her unique body of work and to impart her teaching painting techniques at the attached Royal Academy Schools. Chitra Ramanathan’s paintings and profile have been featured in various magazine and book publications including Who’s Who in America, www.AskArt.com, the Internet Movie Database (IMDB), International Contemporary Artists, Vol 1. available on Amazon.com, the Indianapolis Business Journal, Luxury Real Estate Magazine and others. Drawing and painting from a very early age, Chitra Ramanathan made her foray into art at a weekend art school for children in Kolkata, India when she was four years old. She entered in competitions through several of which she earned prizes throughout her growing years. The early successes led to her seeking higher education by earning a Bachelors degree in Fine Arts from Stella Maris College, Chennai, India. Drawing and painting from a very early age, Chitra Ramanathan made her foray into art at a weekend art school for children in Kolkata, India when she was four years old. She entered competitions throughout her growing years through several of which she earned prizes and recognition. The early successes led to her seeking higher education by earning a Bachelors degree in Fine Arts from Stella Maris College, Chennai India. Other art institutions within the United States. *Art direction, set creation/set design/set construction projects to design, build, construct and paint custom props, creating murals. *Create public art commissions for educational institutions and corporate projects.